Together at last, long time Sydney heroes/ hosts of the greatest parties you have ever been too Hoops & Halfway Crooks have teamed up and are back for one final celebration before we click over to 2014. 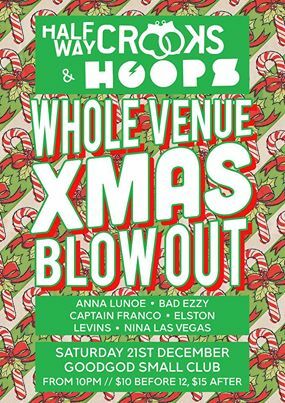 It’s a whole venue takeover with Hoops: Anna Lunoe, Bad Ezzy and Nina Las Vegas going head to head with Halfway Crooks: Captain Franco, Elston and Levins. Expect a mix of rap, new club jams, R&B and classic bangers. To get you ready check out this amazing best of 2013 mix by the all-star cast of Hoops & Halfway Crooks to get you in the mood for Saturday night. Don’t miss out on this christmas miracle of epic proportions!